Promise kept: Greg and I played Campo Santo yesterday. Greg took the Austrians and my French pretended to be Spanish. The Spanish right wing was theoretically quite strong with 2 cuirassiers, 1 dragoons and 2 big battalions Irish. 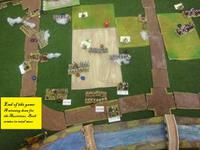 I opened the game moving the cavalry sideways to open room for the Irish battalions to confront Greg's cuirassiers. Greg dodged this move, pulling his cuirassiers back, out of musket range. He turned his medium gun to my infantry. Next round right wing cavalry brought a 6 and with a double move I attacked Greg's cavalry, but they had the better of it. One cuirassiers of mine and one of his got 4 hits and retreated mutually, but my dragoons got 4 hits while his cuirassiers got 3. With this minimal advantage he dared to follow up and next round he attacked them while they were reforming and dispersed them. In the center we advanced both our double lines and Greg shifted his second to the right, to find space so that he would have more shooters. I pushed my center to the front for only two moves, then I waited for Greg to come. Aspremont was a dashing Austrian general and rushed to attack frontally without preparation. His first line got many casualties. my first infantry brigade brought a six, attacked and had the same luck with Aspremont. My Walloon guards were chasing Greg's grenzers, and their only success was that one of the two battalions accumulated 5 hits and was done for. Greg's cuirassiers advanced against my dismounted dragoons, who managed to shoot and fall back twice. and both cuirassier regiments reeled back with 4 hits each. Mac Donald lost one of his gallant regiments. The other fell back to stay level with my cavalry brigade which had received damage and was recovering. a couple of rounds to reorganize. So we decided to call it a day. The Spanish lost 6,5 points while the Austrians 4. Nice to read your Report. Interesting to see a very balanced game again. Why did you shift the village to the other bank of the river? I hope both of you like the scenario after playing it. We really enjoyed the battle, you produced a very balanced scenario! Thank you! Anyway, it didn't cause any problem to the course of the game. I think that you had the Chance to fall back and reform in the safety of a BUA. Not too bad, I assume. It happens some times that I start a game without having printed notes with me, if I make the table setup wrong, it may ruin a battle... But, as both of us had many units reforming at the same time, no one of us could chase the other. Here I include some markers I made for this game, it helps if you stick them to your general's bases. Nice markers, easy to understand. Thank you! I created a Word file as a template and then I made markers for a great number of scenarios we played. I think that it is not too important to have De Gages inferior, as he has to defend himself only. It will be very interesting how he will act at Piacenza, when I will need his activity.